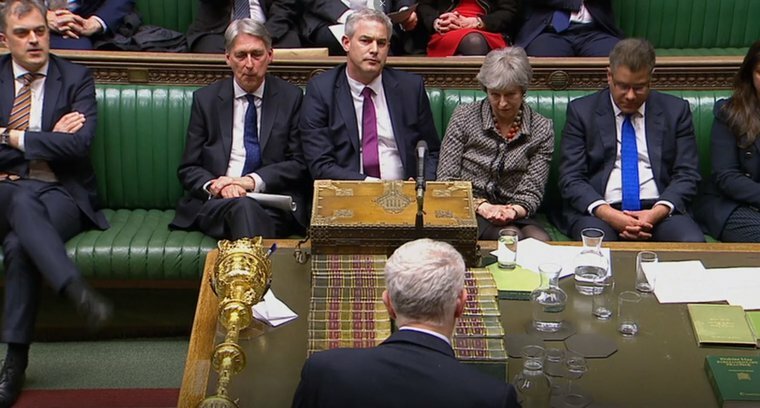 Labour leader Jeremy Corbyn speaking in the House of Commons, April 1, 2019. House of Commons/PA. All rights reserved. As Theresa May has summoned Jeremy Corbyn into No 10 to help her finalise an agreement, we have to hope that he does not share the fatalism and calculation behind your tweet. So Corbyn should be congratulated. His ‘zen’ approach has led to the self-destruction of the oldest political party in the world. As delightful, it has left that party’s main support, the globe’s most vicious and partisan press, floundering. As delightful, it has left that party’s main support, the globe’s most vicious and partisan press, floundering. Their desire won them the contest against the odds. Yet they didn’t know how to win after they won. Now, confused and rebarbative, their cause is imploding. The contrast of motivation can be measured in the ten to one ration of the recent petitions: Revoke Article 50 has more than 6 million signatures while Leave without a Deal just over 600,000. Or contrast the immensely confident million strong march on the 23 of March with the Brexit mobilisation on the 29th (see this as friendly as possible account in the Daily Mail). It must not in any way be led by those officially controlling the Peoples Vote campaign such as Alastair Campbell, Mandelson and, behind them, Tony Blair. No one can stop Campbell doing his hectoring and cussing equivalent of Farage in any campaign, denigrating all who dare to disagree. But the campaign’s leadership must pass to a new generation without a vested interested in restoring the old order. The young men and women who organised the network of 200 local groups that supercharged the Revoke petition, the actual march organisers, the social media advocates of OFOC and FFS and I would add politicians like Caroline Lucas (declaration of interest, I’m part of her Dear Leavers team) and Labour’s Clive Lewis mean an informal alliance is already in place. We need to transform the politics of remain. For Brexit was and is centrally about how we govern ourselves. "Brexit has become a tug-of-war to decide which of these two Englands will win. For as long as this continues, we will all lose. Neither side can be wished away, and long after the arguments about trade deals have ceased, these fundamental divisions will remain. Behind the Brexit wars is a much more fundamental set of questions about the sort of country we want to be. Unless we start to listen, respectfully, to understand and reach an accommodation with one another, there is no prospect of moving on." But we – the remain side – can. We can win the argument to remain in the EU as democrats, not would-be aristocrats. This is why Nandy and you are profoundly mistaken to think you can swerve around a clear resolution by embracing a soft Brexit. This will preserve the very divisions you wish to overcome. We have to build on the democracy that was the kernel of the 2016 referendum; make its moral force our own and apply it to ensuring people can have control by putting any deal back to them in a People's Vote. This is Jeremy Corbyn’s opportunity.